GLOSSYBOX has just announced a spoiler for the February 2014 GLOSSYBOX beauty box. 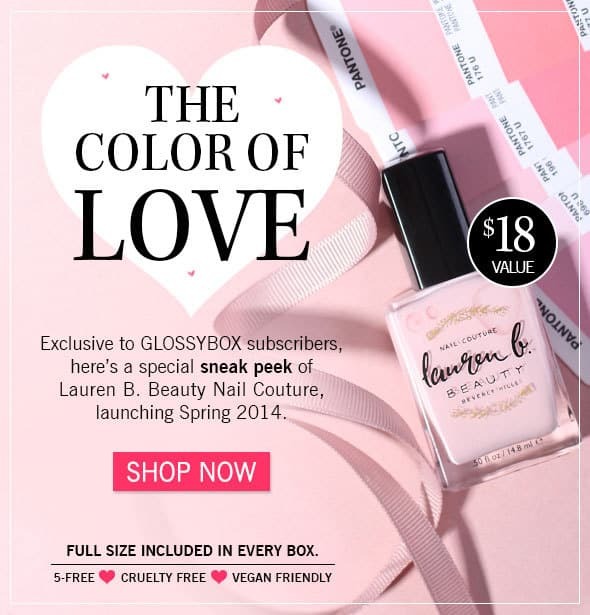 February’s GLOSSYBOX provides a sneak peek of Lauren B. Beauty Nail Couture with a full-sized bottle in every box – an $18 value! Lauren B. Beauty Nail Couture is 5-free, cruelty free and vegan friendly. Not a GLOSSYBOX subscriber? Join GLOSSYBOX today for just $21/month + FREE shipping! Want more spoilers for the February GLOSSYBOX? Check our the second product that will be included in the February 2014 GLOSSYBOX!